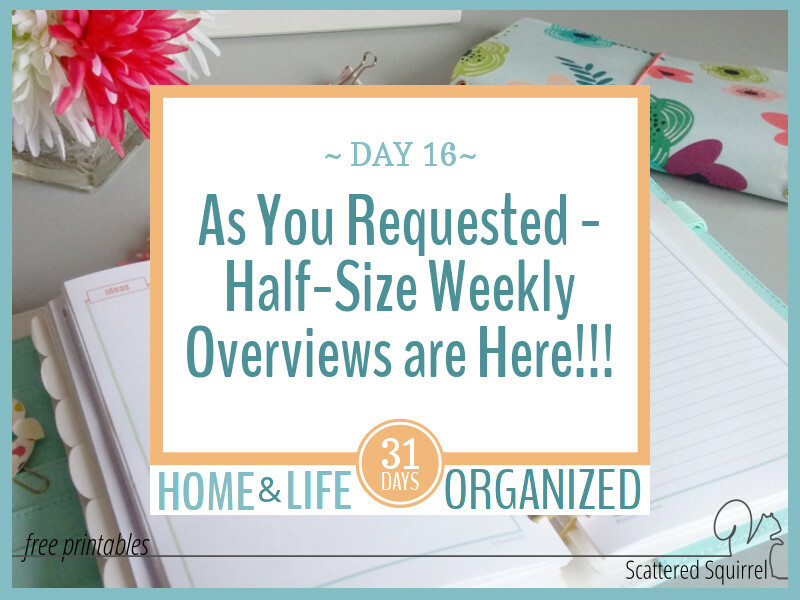 Half-Size Weekly Overview Printables - As You Requested! Earlier this year I updated a number of the planner printables to match the 2016 calendars. During that time I also tried to convert as many as I could to half-size versions. 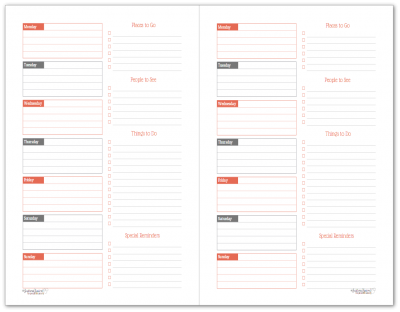 At the time I didn’t think the weekly overview planner printables would convert well. In the last couple of months, I’ve received a number of emails from people asking if I was going to make half-size weekly overview printables before the end of the year. Well, I am happy to say that YES I am and here they are! I haven’t yet had a chance to put these through their paces yet. I did print a few and jot some things down to make sure they weren’t super squishy. They are a little on the tight side, but as they’re half-size printables, there really isn’t much I can do about that. All in all, I didn’t find them too bad to write one, but I would love to hear your thoughts on that, so be sure to drop me a line in the comments if you use them, and let me know what you think! I kept their design the same as their full-size counterparts, so there are six different colours to choose from. 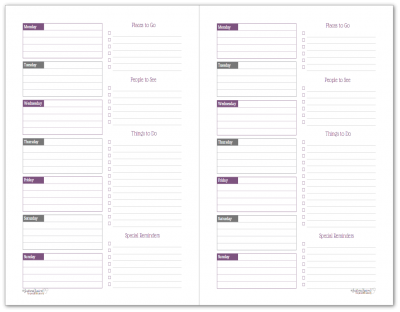 Down the left-hand side of each page are boxes for the days of the week. These spaces can be used for scheduling appointments, events, or things you need to do onto specific days. I tried not to make them too specific so that the categories offer flexibility while still giving some structure. Though I linked to the post above, and you’re more than welcome to hop over and check that out, I thought it would be helpful to also include the full-size versions right here in the post for you. 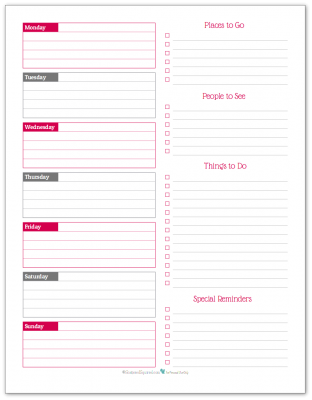 As always to grab a copy (or copies) of the full or half-size weekly overview printables, simply click on their pictures. Now it’s your turn to chime in! What do you think of the half-size weekly overview printables? Do you like overview printables or do you prefer a more standard weekly planner? Drop me a line in the comments below and let me know. Previous Post: « Yearly Planners Make Long Term Planning a Breeze!!!! These are my absolute favorite weekly layout! Thank you so much for making them half sized! I’ve been using them for a year now and they are just about perfect. 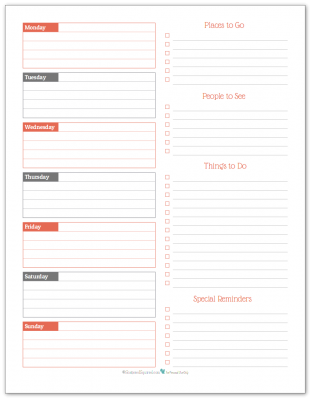 My only wish is that the the check boxes weren’t labeled and just matched up with the days of the week – so that I could put our agenda items in the lined boxes and my to-do’s for each day beside it. But I’ve definitely made it work for me and I love what you do. Thank you! Hi Maria, I’m so happy that you’ve found these printables so useful. I really like the idea of having the to-do list part line up with the days of the week. I’m adding this to my list of planner pages to make. I’ll try to have them ready in July or August. Thank you so much for the suggestion!